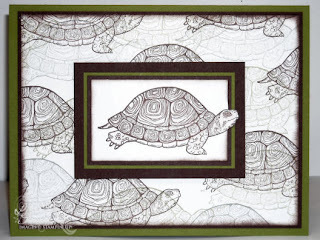 Last night I watercolored 30 of those beautiful turtles from Stampin' Up! 's Natures Nest set. What was I thinking you ask? I'm not quite sure, I guess I was just in the mood to color. I had designed something totally different last week for the Go-Diva's New Catalog Swap, but changed my mind last night when I went to cut the card stock. 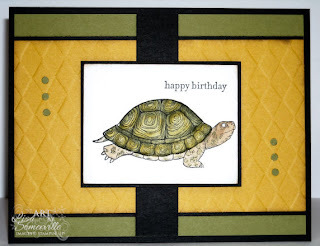 For the focal image, I stamped the turtle in Black Stazon and used the Marker Watercoloring Technique (Olive & Crushed Curry for the shell, Soft Suede for the body, with a touch of Celery added in over the Suede). The Crushed Curry panel behind the image was embossed with the Big Shot and the Harlequin Texturz Plate. Details: (for both cards) all Stampin' Up! If you'd like to order any of the products I used, feel free to shop my website. I love the Nature's Nest set and you have done a beautiful job implementing it in both cards you have posted! Awesome! Beautiful crds, but card 2 gets my vote, you w/c so nicely! But 30! yikerz!! OOOH! I love them both! The good news is that I'll have the second one in my hands soon! It's beautiful, Lisa and so YOU! Can't wait to get mine!